Streaming services like Netflix and Amazon are taking over a lot of the market from TV Networks and more traditional methods of distribution. So it's hardly surprising to see that the networks and studios are increasingly keen to get in on the action themselves. Warner Bros and Turner are the latest to make such a move, with the announcement of a Boomerang standalone subscription streaming service. The Boomerang TV network ( Cartoon Network's sister channel) has been available in countries around the world for quite some time. As you probably already know, the channel broadcasts both classic and new animation from Warners, Hanna-Barbera and others. The new streaming service will include classic content including Looney Tunes, The Flinstones, Scooby Doo and Tom and Jerry. 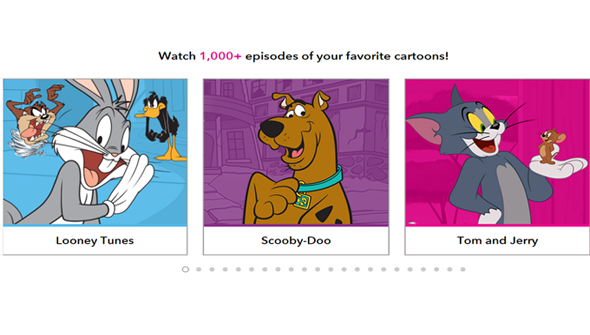 It will also feature original content, with new episodes of New Looney Tunes, Be Cool Scooby Doo and other current shows exclusive to the service. Alongside these new episodes, it will also be home to brand new shows including a reboot of Wacky Races and new series Dorothy And The Wizard Of Oz. Available only in the United States initially, the service will cost $4.99 a month or $39.99 a year. There will also be a free trial available. At launch, it will be available on the web and via iOS and Android devices. Support for Apple TV, Roku and Amazon Fire are planned for further down the line. Other features planned later on include downloads to view offline, Spanish audio and interactive features. Such a potentially impressive library at under five bucks a month sounds like a pretty sweet deal, at least if you don't already have access to the network via cable. However, an increasingly fractured market may not be so great from a consumer's point of view, as people increasingly may find that they have to subscribe to multiple services to access all the content they want. Still- on its own, this is potentially a goldmine for fans of classic animation. Access to an archive of classic Looney Tunes shorts could arguably make it worth it by itself. The service is due to launch sometime this spring, and you can sign up to be notified of any updates via the website.